Manufacturers say they are making rapid progress in the development of Europe's new rocket - the Ariane 6. The vehicle is due to enter service in 2020, gradually replacing the existing workhorse, the Ariane 5. The prime contractor, the recently rebranded ArianeGroup, gave an update on the status of the programme here at this week's Paris Air Show. "We're on track with our roadmap and Ariane 6 is progressing very well," CEO Alain Charmeau told BBC News. 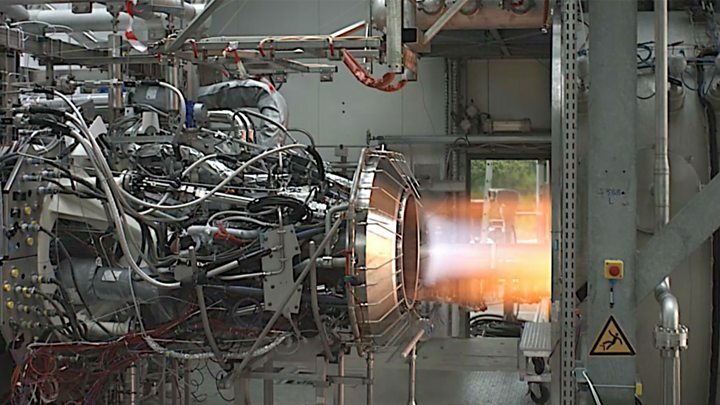 "Perhaps the most spectacular highlight at the moment is the testing of our Vinci engine. It's a brand new engine that will be on our new, versatile upper-stage. And on Monday we had another successful test. We're now well above 100 hundred tests." The Vinci can be stopped and restarted multiple times. It will permit the Ariane 6 to conduct a broader range of missions than its predecessor. It can also bring the upper-stage out of orbit after it has dropped off the satellite payload. This is a nod to the tightening "clean space" requirements that demand rocket operators leave as little debris in space as possible. The recent Vinci firings are being conducted at a facility in Vernon, France. But even as these continue, production of the engine has started at a factory in Ottobrunn, Germany. This will be ramped up over the course of the next three years. Ariane 6 is envisaged as something of a "jack of all trades" launcher. It will assume both the heavy-lifting duties of the Ariane 5 and the medium-lifting missions of the Russian Soyuz rocket that also operates out of Europe's spaceport in Kourou, French Guiana. Ariane 6 will launch everything from constellations of small telecommunications satellites to giant, next-generation space telescopes. To achieve this, it will come in a couple of flavours - the A62 and the A64. 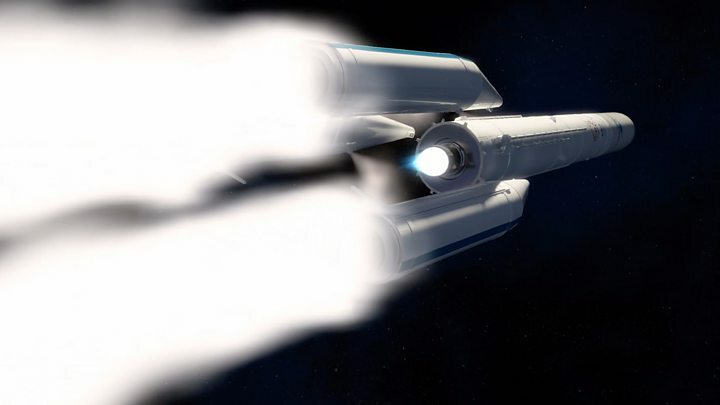 Each will have a liquid-fuelled (hydrogen and oxygen) Vinci upper-stage, and a liquid-fuelled core-stage that uses an improved version of the Ariane 5's current Vulcain engine. But then two or four solid-fuelled boosters will be added, depending on how heavy the satellite payload is and where it needs to be placed in orbit, or even beyond Earth. Media captionArianeGroup CEO Alain Charmeau: "We will be on time"
These boosters are being produced by the Italian Avio group and the first casing is due to head out to Kourou in the next few days to be filled with an inert fuel grain - to verify the overall design. "It's an extremely light motor; very performing," said Avio's CEO Giulio Ranzo. "It's going to contribute significantly to the overall competitiveness of the launcher and the flexibility of turning it from a 62 to a 64." A new range of dispensers is also being developed for the Ariane 6. Dispensers are the devices that hold the satellite payload to the upper-stage during the ascent of the rocket, only letting it go when the right orbit is reached. The expected menagerie of satellites will be mirrored by an equally diverse set of dispensers. Essential as well are new fairings - the clamshell-shaped covers that protect a satellite during the early flight phase up through the atmosphere. Ariane 6 is getting two - one 14m high, the other 20m high. These carbon fibre pieces are being made in one of the biggest curing ovens in the world by Swiss aerospace company RUAG Space. "Our factory is up and running already," said chief executive Peter Guggenbach. "We've reduced the integration steps from five to one. The production is highly automated. Robots control every millimetre, ensuring we have zero defects." The manufacturing consortium is looking for a 40% cost reduction, at least, in the Ariane 6, compared with the Ariane 5. In part that is coming from exploiting new materials and new manufacturing techniques (3D printing, friction stir welding, augmented reality design, etc) and in part by maximising the common use of elements in both the 62 and 64 variants. Avio's solid-fuelled booster is also the same as the first stage on the company's Vega rocket, which launches much smaller satellites. But a big cost saving will come from simply employing fewer people. "There is a transition from Ariane 5 to Ariane 6 (from 2020 to 2023), but from 2024, 2025 onwards - our workforce will be 30% less than today," explained Hans Steininger, the boss of MT Aerospace, which is making the rocket's huge metallic propellant tanks. The Ariane 6 is on a tight schedule. The European Space Agency (Esa), whose member states are funding a large proportion of the development costs, has fixed 16 July 2020 as a deadline for the first flight. "We are really at full speed," said Esa's director of launchers, Daniel Neuenschwander. "But we have to be to meet the target of July 2020. I signed an incentive scheme with industry, so they should be motivated," he told BBC News.